I always appreciate it when readers leave comments or somehow interact with me on the blog's social media pages here or here. Sara Hatch has been kind enough to leave some encouraging words and suggestions in the blog comments on various posts over the past few months. Thank you Sara. She has a blog entitled Edible where she talks about her food, some science, and posts a few recipes. Did someone say recipes? I decided to give her Chicken Puttanesca a try recently. 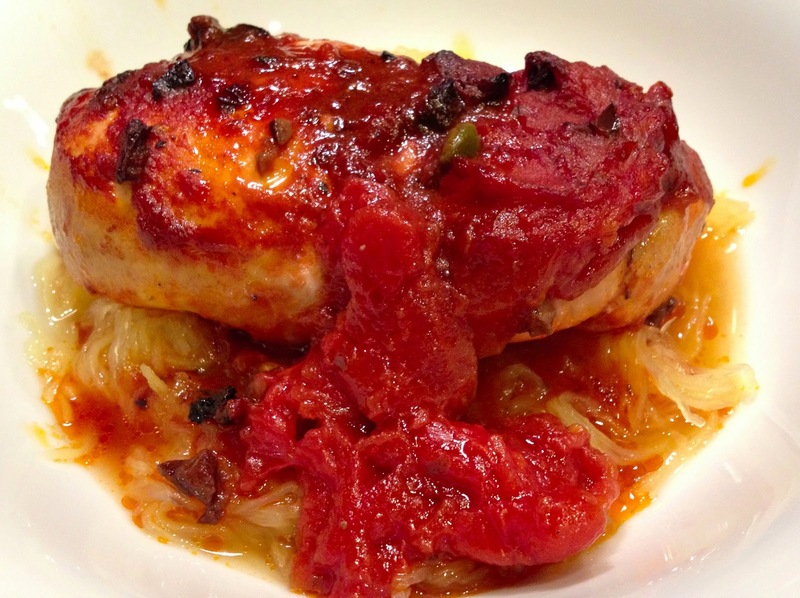 In the recipe, she uses a doctored up Trader Joe's Puttanesca sauce in her version. I don't have a Trader Joe's near me yet, so I decided to make a sauce rather than stand in the grocery store staring at tomato sauce labels for a long while. 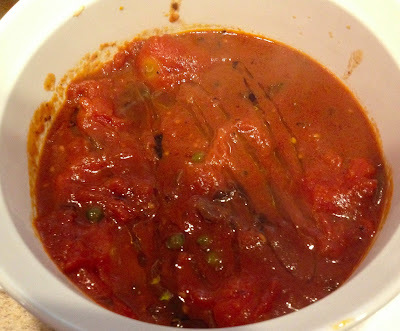 I searched the internet and decided to give this simple Puttanesca Sauce recipe a try. The only ingredient that needed to be omitted was sugar and well, that's no problem for me. 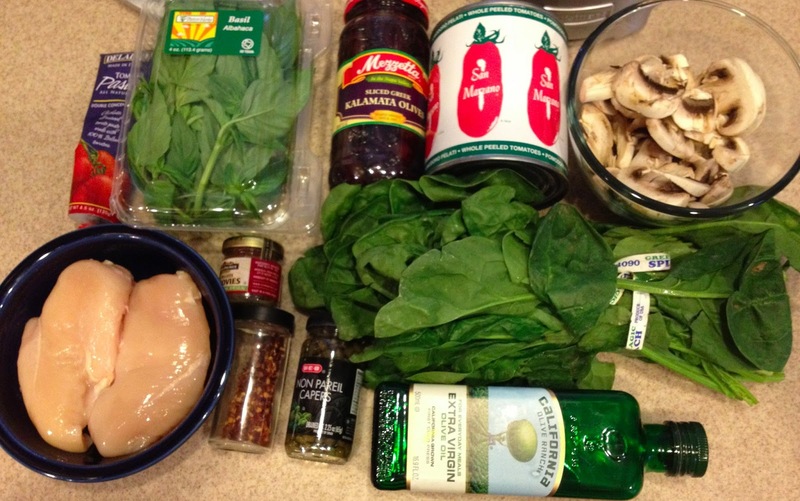 I gathered all of my ingredients and started by preparing the sauce. I measured out 1/4 a cup of Kalamata olives and chopped them up. Next, I needed to fish out 6 anchovy fillets but I couldn't get them out of the jar I had whole. I guesstimated what 6 whole fillets would look like. I heated the oil in a 2.5 quart sauce pan. 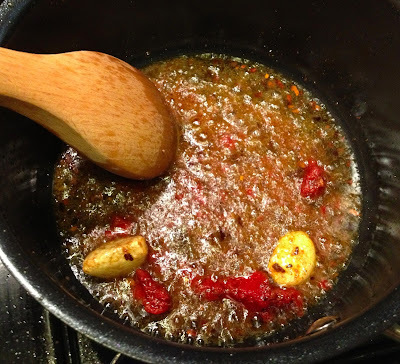 Once it was hot, I added the garlic gloves, anchovies and crushed red chili peppers to the pan. 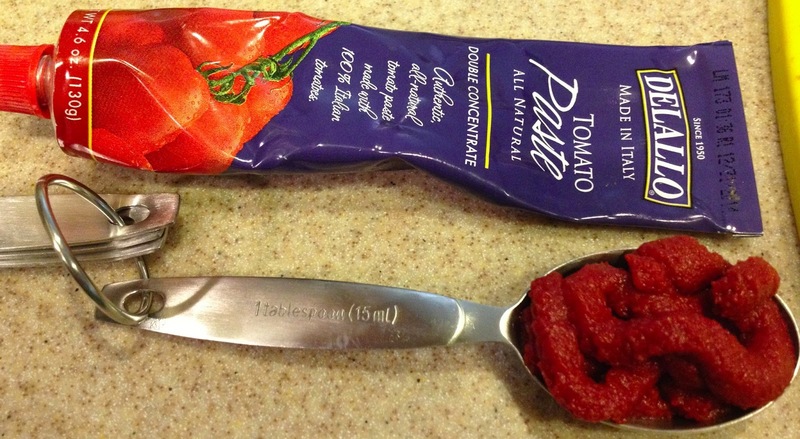 Next, I measured out a tablespoon of tomato paste. I finally bought a tube of tomato paste. Its expensive, but over the long run, I'll save money from not opening a new can of tomato paste every time I just need a tablespoon. By the time I added the tomato paste, my pan was quite hot. If yours gets hot, watch out as the oil will splatter. I stirred the pan for about a minute to make sure everything was combined well. It still amazes me how quickly anchovies disintegrate when cooking with them. Next, I added the tomatoes. I knew I needed to hand crush the whole tomatoes, but hadn't really thought my process through. I opened the can and thought I'd just crush them over the pan straight from the can. Bad idea. These whole tomatoes are juicy and each time I crushed one of them, seeds and juice went everywhere, no matter how careful I was being. I'm glad I had my apron on. Next time, I will crush the tomatoes by hand in a bowl in the sink. 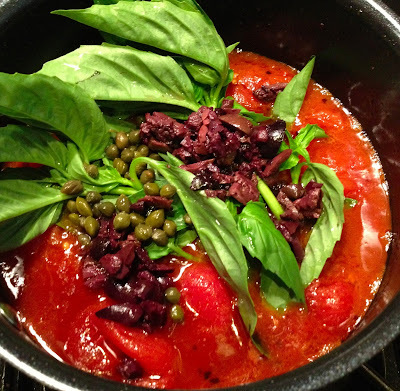 After adding the tomatoes, I added the chopped olives, capers and basil. And gave the sauce a good stir. I added about a teaspoon of salt and pepper. I let the sauce come to the boil and then turned down the heat so it would simmer. I set a timer for 30 minutes. Once the sauce was simmering, I turned to prepare the chicken. I carefully butterflied the chicken breasts. This really isn't as hard as it might sound. Take your time. Try to get your cut in the middle of the thickness of the meat. 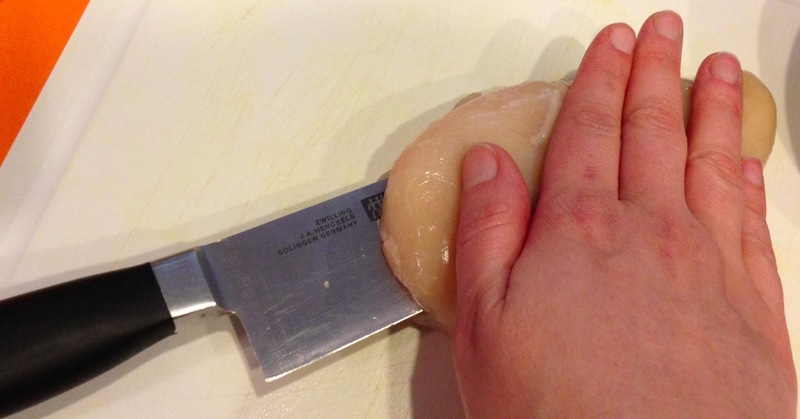 I carefully apply a little pressure with my free hand to better keep my knife in the middle as I cut through the meat. You don't have to get super super close to the edge of the meat, Id say a 1/4 to 1/2 and inch is plenty close. When you think you are close enough, just open up the breast and see if it will lie flat or close to flat. If it does, you are done. Lying close to flat is enough because the next step is to pound the breasts flat until you get as even a thickness as possible. I commented on Sara's original post as to the goal thickness and she said about 1/4 an inch. 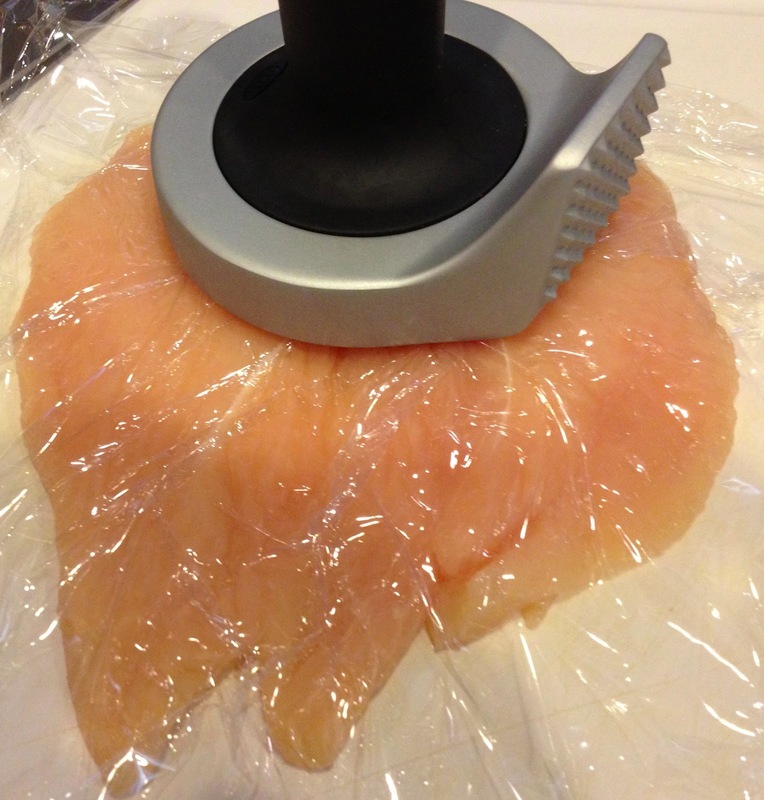 You'll want to put a piece of plastic wrap or wax paper between your chicken and tenderizer or you will get chicken splatter everywhere. 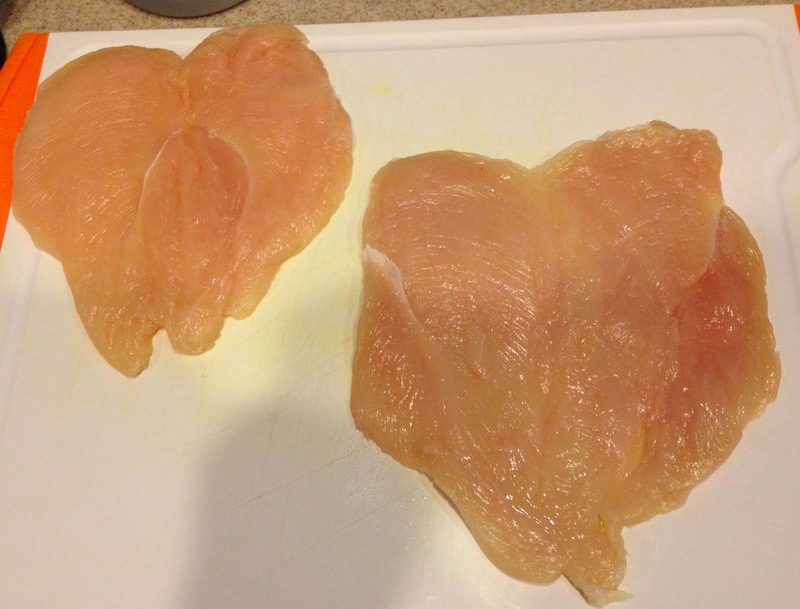 Here are my two butterflied and flattened breasts ready for stuffing or rolling as the case may be. First, I added the layer of fresh basil. Sara doesn't say how much basil to buy. As you can see you don't need much and it will all depend on the size of leaves you buy. I measured the basil I used and it was about 1/4 cup by volume and 5/8 oz by weight. I didn't worry about the lack of specificity before making the recipe because I knew I needed a large container as I was using some for the sauce. 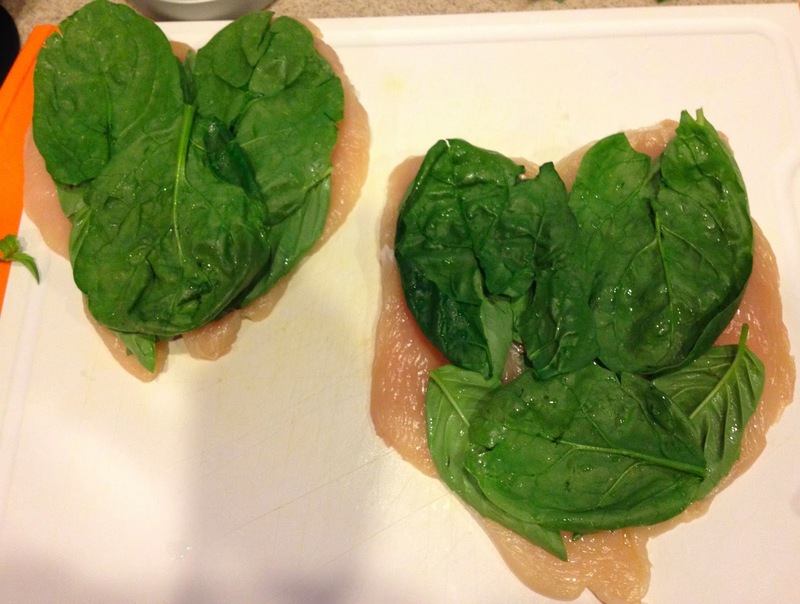 Next, I added a layer of spinach. I think Sara used baby spinach. I was feeling a little miserly at the store, so I bought a plain unwashed bunch of spinach for 99 cents. The leaves are bigger but the flavor is the same. Again, this measured out to about 1/4 by volume or 5/8 oz by weight. 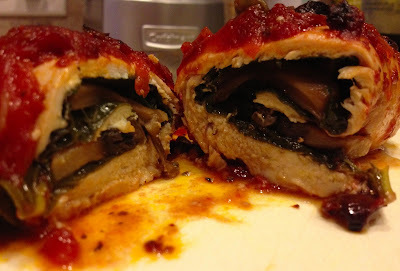 Next, I added the mushroom layer. I think my mushrooms were bigger than Sara's, but that's ok. 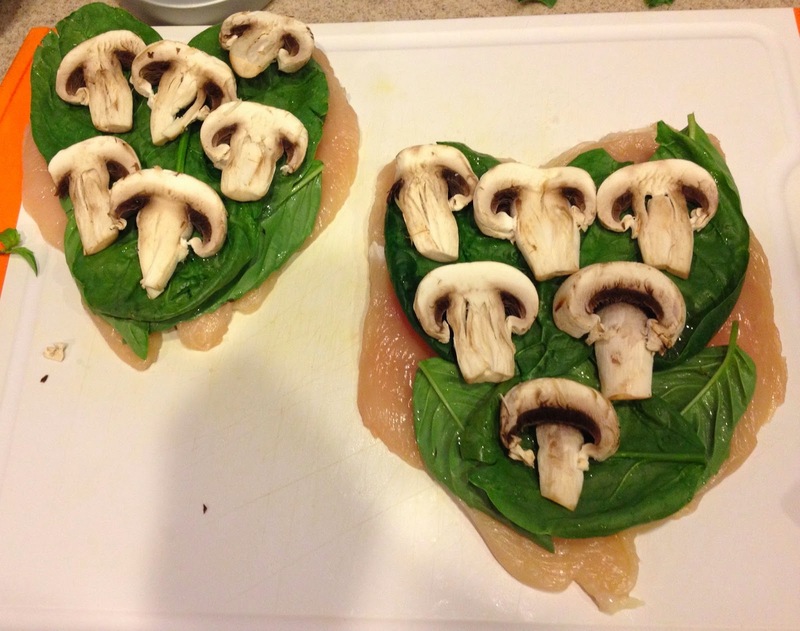 I used 2 ounces of mushrooms or about 1/3 cup per breast. When I was ready to roll these up, there was still 9 minutes left on the sauce, so I waited. Knowing that it takes my oven about 10 minutes to heat to 350 degrees, I turned it on to pre-heat. 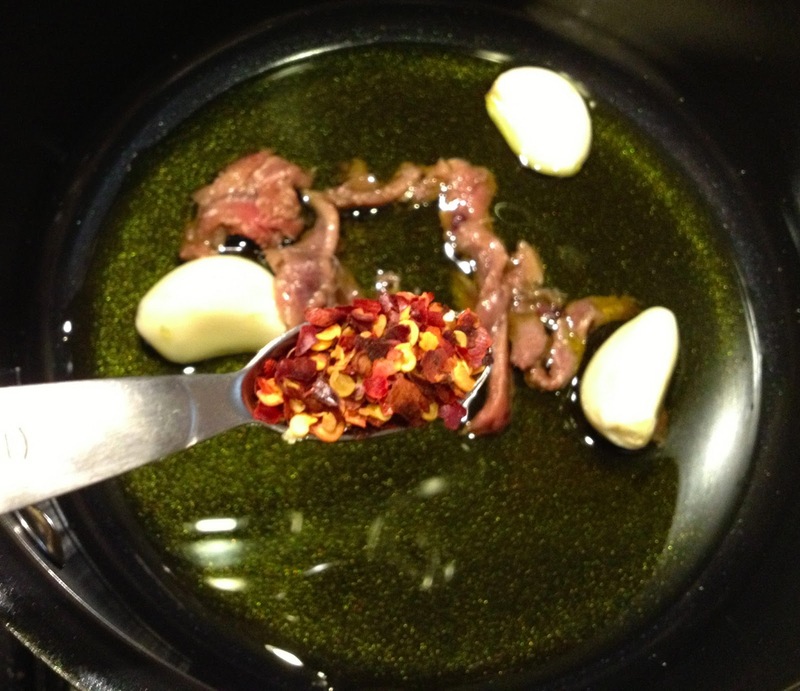 Once the sauce was done, I removed the garlic cloves and basil leaves. I decided to use a 1.5 quart round baking dish. I would not use anything smaller. I measured out a cup of the sauce and added it to the bottom of the dish and drizzled a little olive oil on top of the sauce. I'd say it wasn't more than 1.5 tablespoons of olive oil total. Since the baking dish was ready to receive the chicken, I carefully rolled up the chicken breasts. 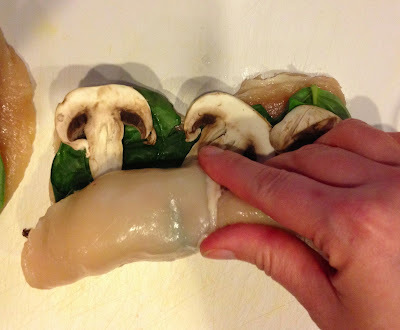 You'll feel as you roll that your mushrooms may break a bit, but that's ok.
After rolling both breasts and carefully placing them in the baking dish, I added enough sauce to cover the chicken breasts. I used about 1 cup of sauce for this step. Here it is ready for the oven. I put it in the oven and set a timer for 1 hour. Here is what it looked like when I took it out of the oven. I steamed some spaghetti squash while the chicken was baking. Here is my dinner plate. Here is what it looks like when you cut into it. Pretty layers of flavor. Accessibility & Cost of Ingredients: You should be able to find all of the ingredients for the sauce and the chicken at your "big box" grocery store. The sauce calls for a 35 once can of whole peeled Italian tomatoes. The largest can I found was 28 ounces. For the sake of reviewing the recipe, I bought fancy Italian tomatoes that were $3.98/can. Next time, I'm fairly certain and whole peeled canned tomato will do. Something I thought about when I went shopping for this is that until you have a well stocked kitchen, shopping for whole foods can seem expensive. I made a trip after work to get the things I needed to make the sauce and the chicken. I bought the chicken breasts, 4 oz basil, 1 can tomatoes, the olives, and the capers and my grocery bill came to $23.11. I think some get scared away from cooking whole foods, paleo or otherwise, after grocery trips like this. As I left the store, I thought "Geez, that's $23 for one meal (not including the ingredients I happened to have at home already)." But then I realized, this really wasn't for one meal. The olives and capers will last for a very long time in the refrigerator and can be used for several meals. It just so happened I was out of them. My point is, if you are just first stocking your kitchen, yes, a few grocery visits will feel a bit expensive when you are buying spices, dried herbs, and condiments like olives and capers, but once you have these things, you wont buy many of these items again for a long time. Of course, you can make this dish less expensively than I did if you can find a clean tomato sauce that you like, I just wanted to make it special and fresh. It doesn't even have to be a puttanesca sauce, but it will be lacking in some flavor I think if you don't use one. Preparation & Cooking Time: The sauce took a total of 48 minutes to make. I think I can get the preparation time on this down a bit the next time I make it. It took me 19 minutes to prepare the chicken from butterflying to rolling. It took me 5 minutes to fill the casserole dish once the sauce was ready, so that makes a grand total of 24 minutes preparation time. I baked the chicken for 1 hour. 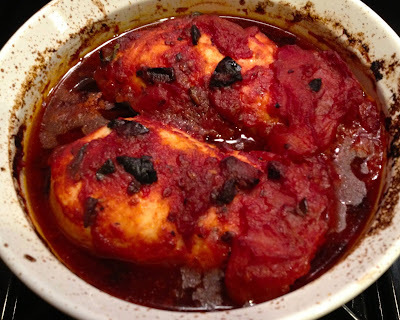 So if you have a sauce ready and aren't immediately hungry, this is a reasonable weeknight dish. 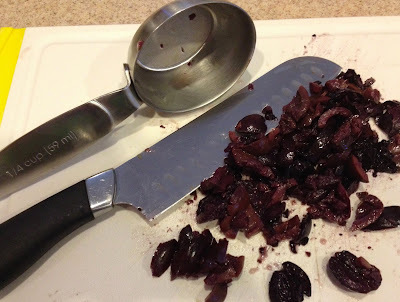 Clean Up: Everything I used to prepare this recipe except my wooden spoon and sauce pan went into the dishwasher. I was able to get the clean up done fairly quickly as I cooked. The casserole needed some mild pre-dishwasher scrubbing. The Paleo Review: Chicken Puttanesca: Thumbs Up! Sara has created a super tasty dish! While the basil, spinach, and mushroom add a great hidden flavor boost, the flavor of your dish will be largely determined by the sauce you use. The chicken is juice and tender. Lovely. 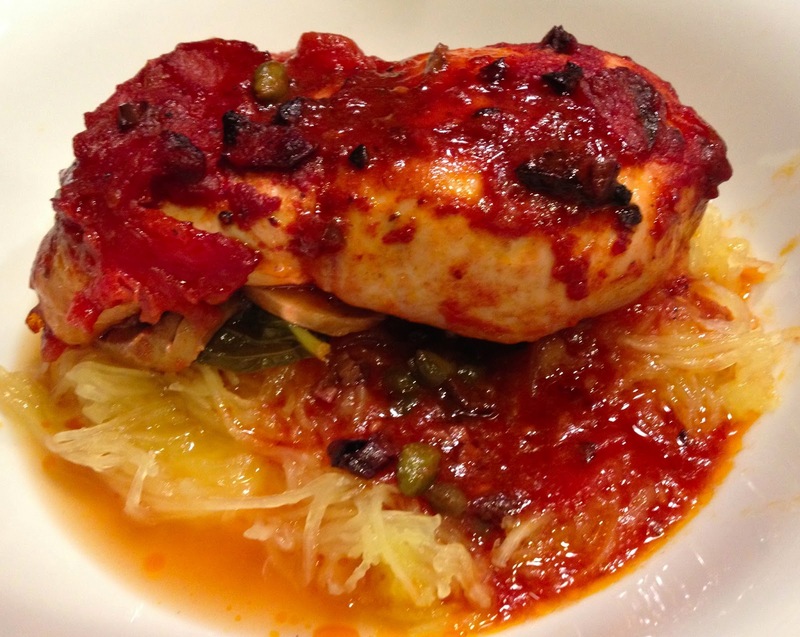 The Paleo Review Puttanesca Sauce: Double Thumbs Up! At first, by itself the sauce seemed a little salty to me, but when added to the chicken and spaghetti squash, I thought it was just right. The sauce really improves with a night or two in the refrigerator. It has a deep flavor that I've not had in a jarred sauce. If you've not made your own sauce, give this one a try. Seriously. Once you've made it, add it to Sara's recipe and you've got a company worthy dinner. 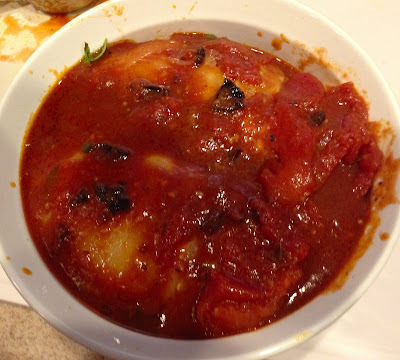 Alternative Skillet Preparation: Not to diminish Sara's recipe at all, but if you don't have time to bake this dish for an hour, have a good tomato sauce on hand, you can achieve the flavor of this dish in about 20 minutes. I came home from work one evening and looked in my fridge and I essentially had the leftover ingredients from making this recipe to use up. 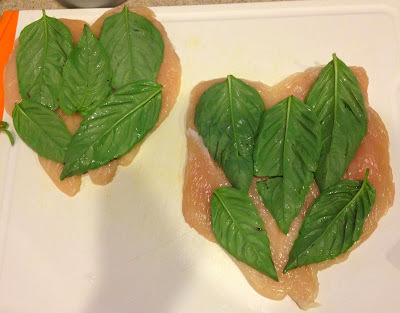 I had one chicken breast left, so I butterflied it. I added a tablespoon of olive oil to my 12 inch skillet, minced 2 cloves of garlic with my garlic press into the pan and added the chicken breast. I let the chicken brown a bit on both sides (3-5 minutes per side). 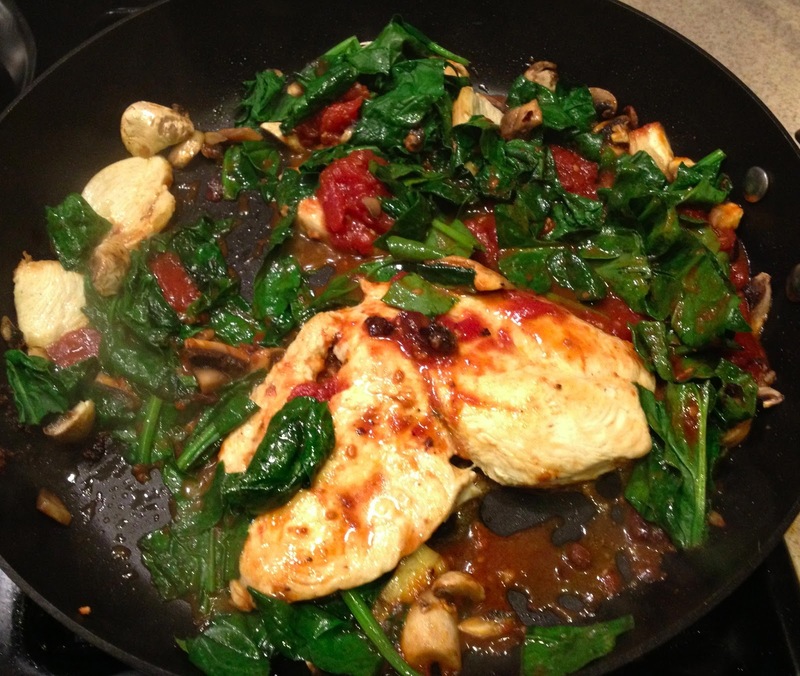 When the chicken was nearly done on the second side, I added about 1 cup chopped mushrooms, the remainder of the leaves from the bunch of spinach (about 2 cups), and the left over cup of sauce to the pan. I gave it a good stir and put the lid on for 2-3 minutes to get the spinach to wilt. The times above are guesstimated but I started playing a show on Netflix before I went into the kitchen and by the time it was done and plated I was about 20 minutes into the show. When I was done, I must say it was pretty darn tasty.